Knighton and the Teme Valley has an excellent range of tearooms, cafes, takeaways, country pubs and resturants serving menus to suit all tastes. Beautiful Country House Hotel with four acres of gardens with riverside walks, croquet lawn, wildlife pond. A productive kitchen garden, which provides many of the vegetables served in the restaurant. Lunch and dinner is served in the award winning restaurant. The Radnorshire Arms is a traditional Black & White 17th Century Drovers Inn in the beautiful Teme Valley. We are a small social enterprise representing the artists and makers of the Marches. We also serve pretty good coffee, 30+ types of leaf tea and infusion and make all our own food including our bread. Dogs are welcome. 95% of our non-local stock is fairly traded. 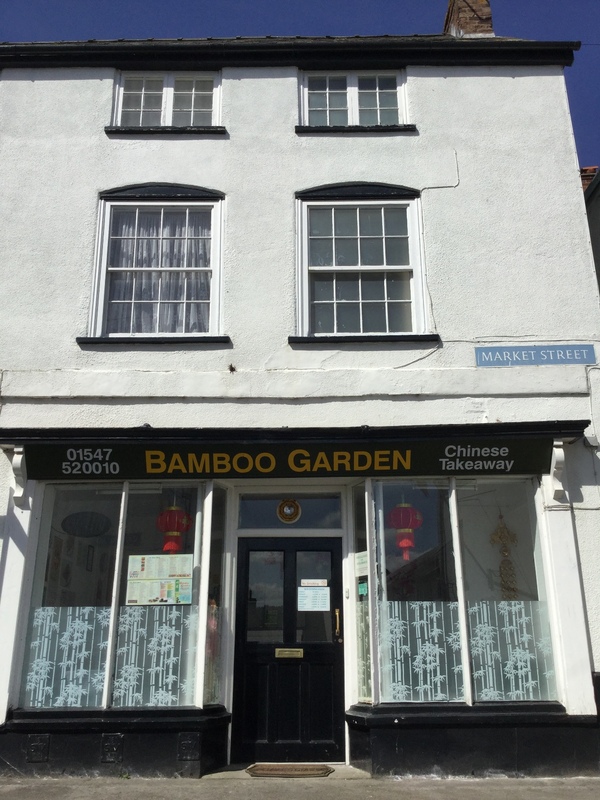 The Bamboo Garden Chinese takeaway menu specializes in Chinese cuisine and some English dishes. A takeaway is the perfect antidote to slaving in the kitchen after a hard day’s work. Closed on Mondays except bank holidays . “JustDean’s” serves breakfasts, lunches and takeaways, all with a generous side order of Black Country wit. home cooked food. We also offer Thai cuisine, freshly prepared in house with the owner’s own recipes. Probably some of the tastiest Thai cuisine you are likely to find outside of Thailand, all lovingly prepared and cooked by the owner Ying. Open 7 days a week Monday to Thursday 1830 to 23.00. Friday, Saturday 18.30 to 23.30, food served 18.30 to 21.00. Sunday Lunch 12.00 to 15.00 Sunday evening 19.00 to 23.00. Our hours will be extending in the summer months so please visit our website for more info. If you would like to be listed on www.visitknighton.co.uk please contact us for more details. View our events page for more info about what's coming up! Radnor Hills is a family owned and run business that has been running for over 25 years, we bottle a diverse range of mineral water, flavoured spring water, sparkling premium pressés, fruit juices and school compliant drinks. We have a passion for making the simplest of things taste great and our drinks ranges include: Radnor Hills Mineral Water, Aqua Splash, Fruella, Heartsease Farm, Radnor Fizz and Radnor Fruits.